Dive right in and start spinning for treasure with “Capt. Quid’s Treasure Quest” slots by Wagerworks. This slots game offers players the opportunity to play for a fifty thousand coin jackpot, and with a one dollar denomination and the ability to bet five coins per line, there is a large range of winning potential to be found in this game. The thrilling graphics of this game include a pirate’s ship background and a jolly roger at the top of the screen. Symbols used on this machine include the “Capt. Quid’s Treasure Quest” logo, the treasure chest, the pirate captain, the ship, the pirates, the compass, and the standard Aces, Kings, Queens, Jacks, and tens. With a fifty thousand coin jackpot offered for players opting to bet the maximum number of coins, there is certainly plenty of treasure to be found in this game. While there is no autoplay feature to be found in “Capt. Quid’s Treasure Quest”, there are a number of bonuses and exciting payouts. The game offers fifteen paylines spanning across the five reels, ensuring that players have many different ways to hit a winning combination. Three paylines run across the screen horizontally, while the remainder is comprised of an array of diagonal lines. “Capt. Quid’s Treasure Quest” offers numerous payouts, including a fifty thousand jackpot that is awarded when a player gets five “Capt. 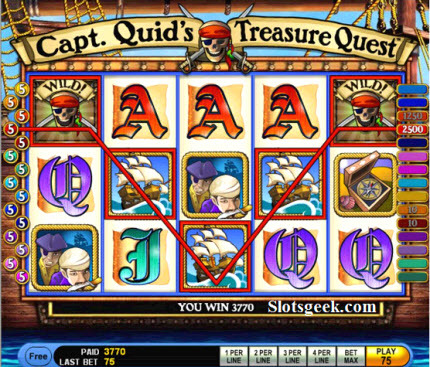 Quid’s Treasure Quest” logos on a single active payline while playing the maximum bet. When betting a single coin on the winning payline, payouts are as follows. Five of the game logos pay ten thousand coins, four pay one thousand, three pay one hundred, and two pay twenty. 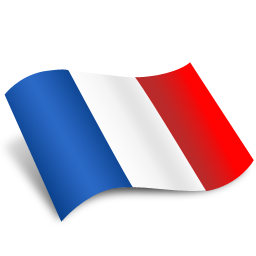 This symbol is also the wild symbol for this machine and can substitute for any symbol except the bonus treasure chest. Five pirate captains offer a thousand coin payout, while four pay five hundred, three pay fifty, and two pay three. Five ships offer a five hundred coin payout, four offer two hundred, and three offer twenty five coins. Two ships pay two coins. Lucky spinners who get five pirates on the reels are rewarded with five hundred coins, while four pay one hundred, three pay twenty-five, and two pay two. Five compasses on a single payline are worth five hundred coins, four are worth one hundred, and three are worth twenty. Players getting five Aces or five Kings on a single active payline are given two hundred fifty coins, while four are worth fifty coins and three are worth fifteen coins. Five Queens offer players two hundred coins, while four pay out twenty-five coins and three pay ten. Five Jacks or five tens are worth a one hundred fifty coin payout, four are worth twenty coins, and three are worth five coins. Three treasure chests trigger the “Capt. Quid’s Treasure Quest” bonus feature, which allows players to dig for free spins as well as multipliers that will add to the value of the spins. There is much on offer in this game, ensuring that players will have a great deal of fun as they experience the excitement of this treasure quest.